March 13, Monday, is when the roof of the house is finally going to be demolished to make way for G.I. (galvanized iron) sheet roofing. 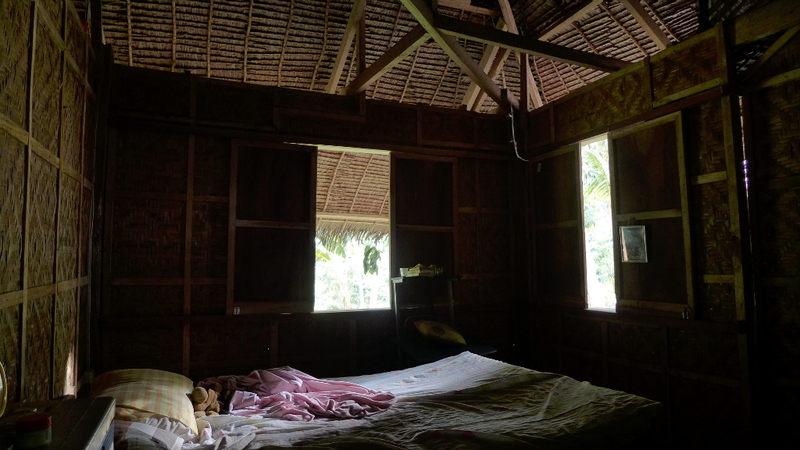 So, in preparation for that, I have been trying to sort through all my things, throw away what is not needed and protect the rest from rain and debris. 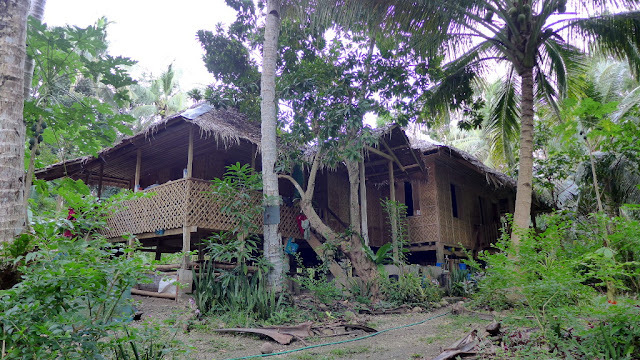 Below is a photo of our house with its beautiful nipa palm fronds for roof. Maintaining a roof like this has become difficult over the years so we are forced to give this up for the modern G.I. roofing. 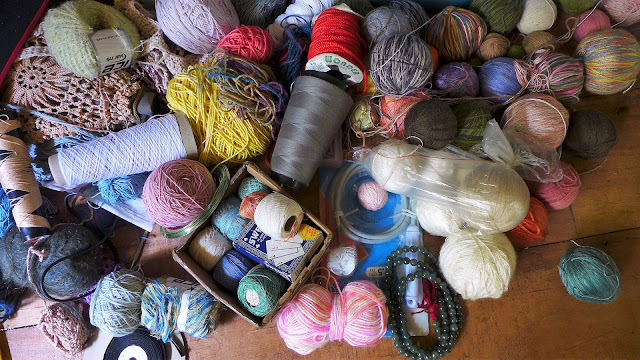 As a result of such ‘Spring Cleaning”, I am now in possession of lots of scrap yarn. I am keeping these in plastic bags at the moment and will be working on new projects suited to such small amounts of yarn of different colours, weights and types. 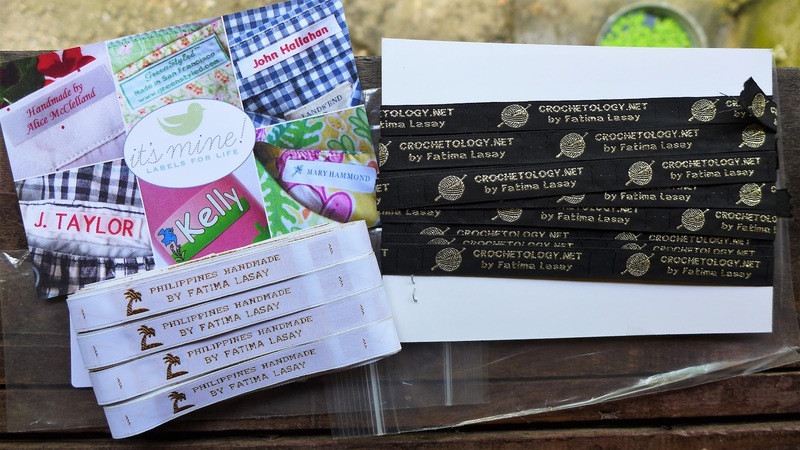 My personalised woven labels have finally arrived!!! I placed the order January 26. The labels were shipped February 14. 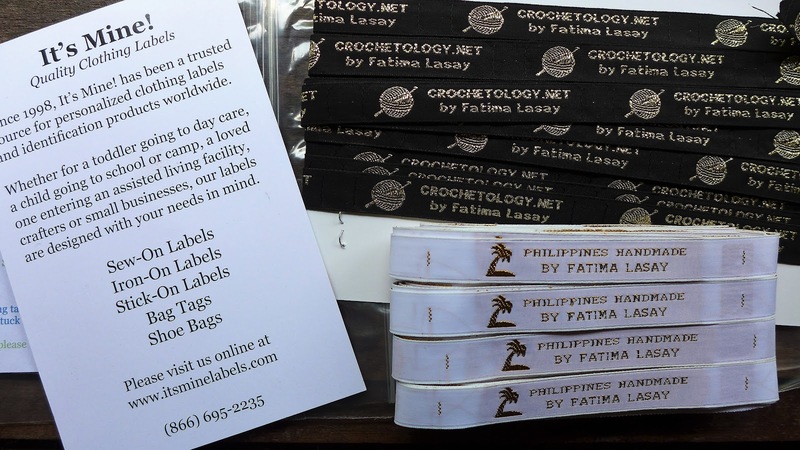 And the labels arrived March 3. Shipping is US$30 to the Philippines, very expensive. I opted for this shipping (USPS Priority Int'l) because I thought it was like UPS or EMS that could ship in 5 days but I was wrong. Next time I'll go for the regular USPS at only US$5! The quality of the labels is excellent and best of all you can order in small volume. There are local label makers but you need to order 5,000 pieces. So for small home-based craft like mine, the small volume from Itsminelabels.com is just right. 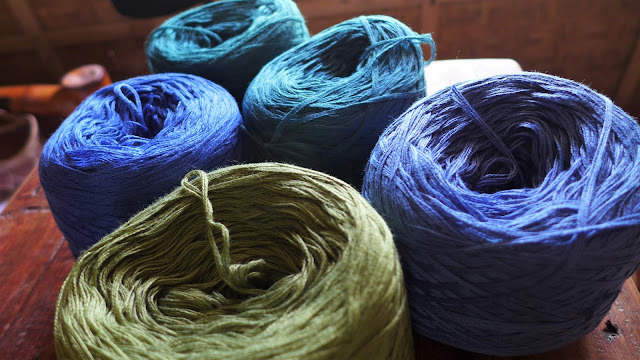 I'm also excited to tell you about a Philippines-based yarn shop that has just sent these awesome color yarns! 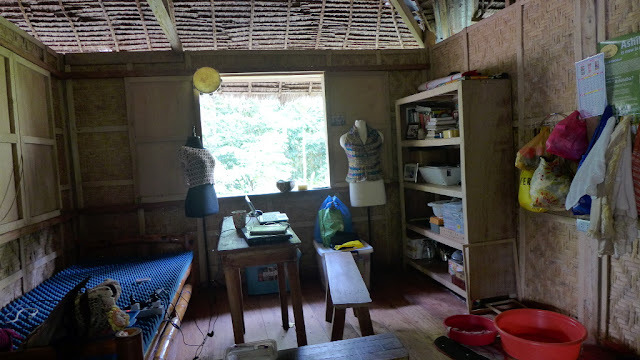 They are called Sugar Free Fiber Arts and their website is at sugarfreefiberarts.com - those of you from the Philippines have probably heard about them. They customize and blend yarns by hand-winding strands in exciting colors, you have to see the yarns on their website! And why "Sugar Free" you might ask? Well the yarn shop grew out of the founder's determination to seek ways to fund the medical needs of her son who has been diagnosed with Type 1 juvenile Diabetes. I think this is awesome! I know how hard it is to even try to get your act together in the midst of desperation, but Sugar Free is doing it! Find Sugar Free on FB at facebook.com/sugarfreefiberarts. Now let me introduce you to two amazing women I met on-line and are now my new crochet friends! First, there’s Jan of Urban Gypsy Crochet in Manchester, UK. She’s such a sweet, chatty, warm-hearted lady, who makes beautiful cardigans and shawls. You can find her Etsy Shop at etsy.com/uk/shop/UrbanGypsyCrochet – Jan’s crochet items are all fairly priced and her colour combinations are beautiful! 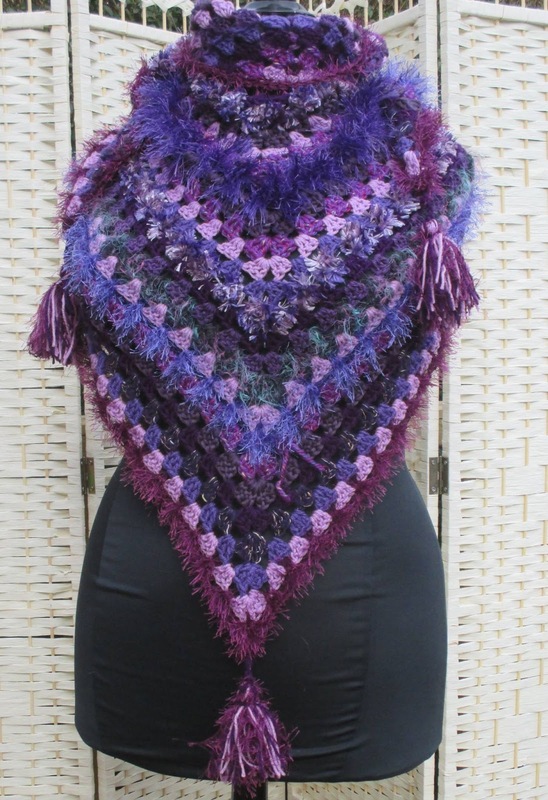 I especially love this mixed fibre shawl (photo above) that she made. Please do visit Jan’s Etsy Shop and also on Facebook via facebook.com/Urbangypsycrochet/ and say hello! 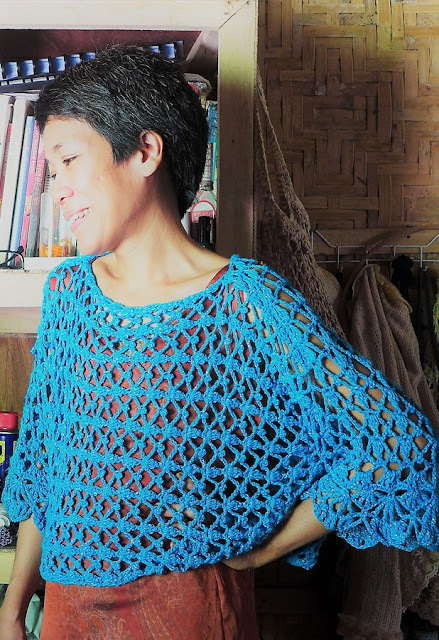 And then there’s Rose who crochets and podcasts from Manila, Philippines, quite a distance from where I live, but we hope to meet up this year! I met Rose via Jan, and this way got introduced to podcasts and video blogging. You can find Rose’s videos at youtube.com/user/cedieaqui/videos – she apparently loves crochet, especially amigurumis. 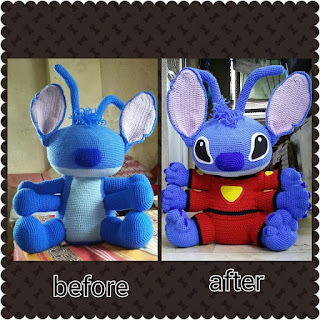 Here (above photo) is one of Rose’s big amigurumis – before and after photos. 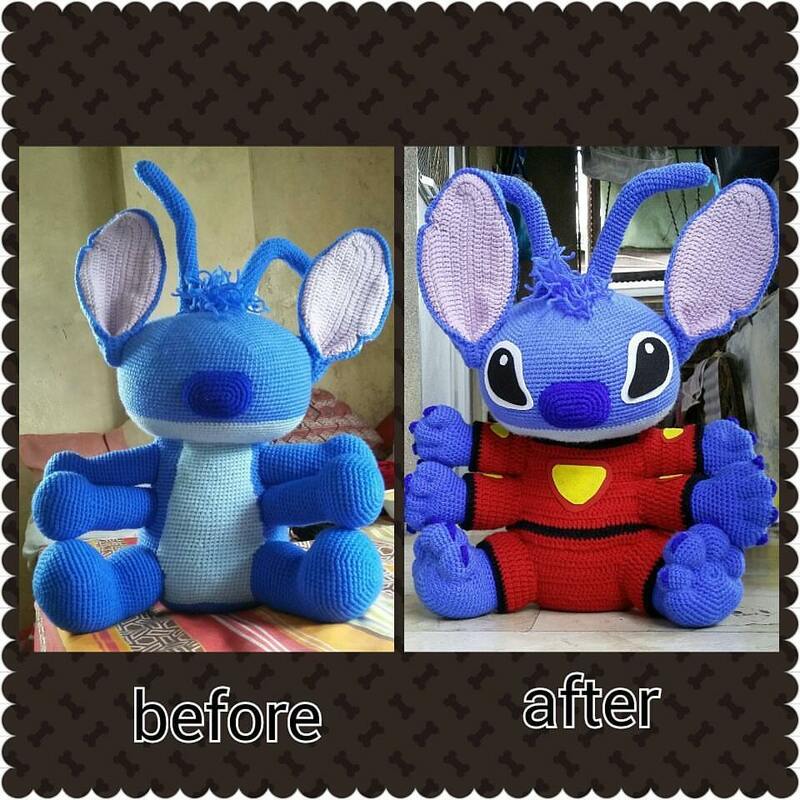 It’s the suited character Stitch. And guess what? We celebrate our birthdays on the same day! Please say hello to Rose on her Youtube channel!